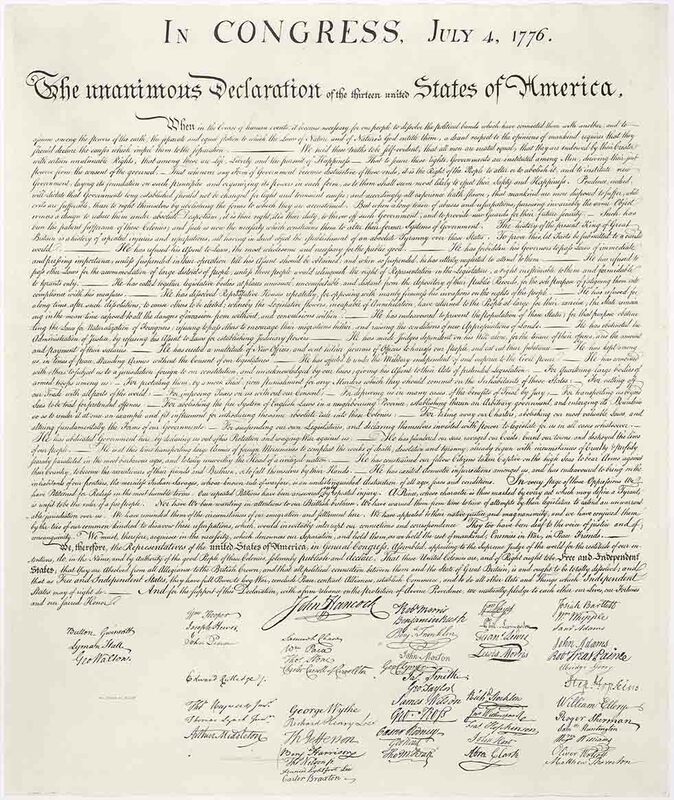 In 1776, American colonists finally decided that enough was enough after suffering decades of abuse and grief imposed arbitrarily by a distant Crown and Parliament and while engaged in a shooting war with the Mother Country. 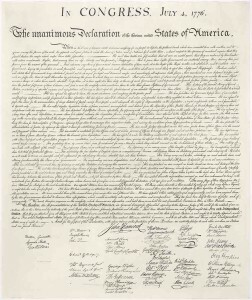 The Continental Congress, chaired by John Adams, commissioned Thomas Jefferson to write the draft of a document that would be the instrument for announcing secession from the British Empire. The tone of the document is polite, informative, and cultured. Jefferson felt that a move as radical as breaking the long existing bonds that connected us to Britain required a detailed explanation so that the world would be aware of the grievances that necessitated this action. At that time Jefferson enumerated no fewer than 27 complaints, pointing out the Crown’s behavior that made it impossible for the Colonies to continue on the path they had been traveling. In a mere two years, it will have been 240 years since the Great Experiment that is the United States commenced. We have progressed from 13 backwater, remotely located colonies to the greatest nation the world has ever seen. We spread from ocean to ocean and were blessed with abundant raw materials that allowed us to become an industrial giant. We were envied and emulated throughout the world. We called out to the world’s tired, poor, and huddled masses desiring to breath free and they came by the millions to a land of freedom such as the world had never seen. They came to a nation that offered the opportunity to strive for whatever success they were capable of achieving. And they succeeded beyond all belief. So, what happened? In the nearly 10,000 years of human civilization, there had never been anything like it. Talk about exceptionalism! Men had always been told by their betters where to go, what to do, how long to do it, and how much they were required to turn over to their kings and priests for their right to exist. They were the rulers’ property, to be used as needed. Our Founders tried something new. A nation of sovereign citizens endowed with rights that came from God and not from a government. Those rights were ours by the very nature of our existence. Nature’s God was identified as the source of our liberty and freedom. The very same God we have removed from our schools, courts, and public view. Our Founders told us this experiment would only work for a highly moral, Godly people. We were once that . . . are we still that? We obviously have lost our way. We are not the people we once were. We stopped believing that character was a necessary ingredient in the people we elect. We went from citizen-legislators to professional politicians. They stay in office until power corrupts. Most come in poor and go out rich. We got what we deserved. When I went to school we were taught that a vigilant and knowledgeable citizenry was necessary to maintain our republic. In our apathy we have allowed a new elite to arise and return us to the bad old days of tyranny. If Jefferson were still around, he might rewrite his list of grievances as shown below. The History of the present Federal Government and many State Governments in our nation is one of repeated Injuries and Usurpations, all having in direct Object the establishment of an absolute Tyranny over the People they serve. To prove this, let Facts be submitted to a candid World. THEY have refused their Assent to enforce the Laws they do not like, though they be the most wholesome and necessary for the public Good. THEY have repeatedly and blatantly ignored their solemn Oath to defend and protect the Constitution. THEY give no consideration in their deliberations to Powers that are allowed and Powers that are outside the Government’s purview. THEY have changed the Presidency from one of three separate, but equal, parts of Government to an Imperial Office that rules by Imperial Decree. THEY have turned Lying and Obfuscation into art forms, using them to cover up scandal after scandal. THEY have erected a multitude of new Agencies, and sent hither Swarms of Bureaucrats to harass the People that they consider Enemies, and to eat out and steal our Substance. THEY have made the Judiciary a Sinecure for Party Hacks as rewards for past service and as Assurance of future directed interpretation of the Law and the Constitution. THEY have stopped representing the People and are concerned only with the special Interests that fill their Coffers. Their primary Purpose is to be reelected at any cost to their Character and their Honor. THEY have abrogated legal Contracts between Investors and private Businesses; they have fired CEOs, regulated Wages, threatened Banks and used taxpayers’ Money to gain control over vast areas of the nation’s Economy at the cost of the loss of more of our Freedoms. THEY have openly proclaimed that this is not a Christian Nation, despite the plethora of historic evidence in our founding Documents and in the Writings of our Founding Fathers, myself included. THEY are attempting to destroy the sanctity of Marriage as being the joining of one Man and one Woman and thereby weaken the concept of Family. They have taken control of our Children, telling us they belong to the State. THEY seek to encourage Infanticide as an acceptable form of birth control by murdering the unborn Child. They seek to free us from responsibility for the act of Murder. THEY manufacture Crisis after Crisis that they use at every turn to diminish our Liberty and Freedom and increase their Power. THEY fail to protect our Borders from Hoards of alien Invaders who have become a Blight on our Nation. They are freely given Benefits that American Citizens cannot afford and are not allowed. THEY squander our Wealth, passing Laws designed solely to gain their reelection. THEY have taxed and spent us into Poverty and have burdened our Children and Grandchildren with a Debt that is beyond redemption under our present Constitutional form of Government. THEY have abrogated their responsibility to control our Currency but have, through arrangement with the Federal Reserve Banks (Banks that are not Federal, nor do they have any Reserves), printed fiat Money to the extent that our Dollar has lost more than 75 percent of its value in the span of one Lifetime. THEY have conspired amongst themselves to subject us to a Global Jurisdiction foreign to our Constitution, and unacknowledged by our rightful Laws, giving assent to their Acts of pretended Legislation. FOR imposing Tax after Tax on us without our Consent, often hiding the Fact in the Bowels of thousand-Page Laws. FOR destroying our nation’s medical care by forcing the ACA (Obamacare) upon us, a program that is so flawed that the Crisis caused by its collapse will be used to implement single-payer Socialized Medicine. FOR establishing a nanny State that protects us from Cradle to Grave from responsibility for our behavior at the expense of our Freedom. We are now a Nation where trillions have been spent on Social Programs with little impact upon the Number of Poor among us. FOR turning us into a Nation that has the largest Prison Population (per capita) in the World. FOR removing God and Prayer from our National life and then being amazed at the Consequences. FOR developing and implementing a system of compulsory Government schooling designed, not to Educate our Children, but to Condition them to become complacent, obedient Consumers and reliable replacement Parts for the Corporations to which our Politicians are obligated. Our schooling is an ongoing social Experiment and our Children are the Rats in the Maze. FOR bringing us from a position in the World that was envied by all and emulated by many to the brink of becoming a third-world Nation, hated by all and laughed at by most. FOR using the Executive Branch bureaucracy (IRS, NSA, DEA, FBI, etc.) as a weapon to harass and destroy political opposition. FOR passing so many Laws and writing hundreds of thousands of Pages of Regulations that a Citizen cannot get out of Bed in the morning without committing a dozen Violations in the process. FOR continuing their attempts to disarm the Citizenry through Laws and Regulations in direct violation of the Second Amendment of the Constitution. This List could go on forever. The bottom line is that we are as Mad as Hell, and refuse to take it anymore. WE demand a return to our Constitutional form of Government, Executive and Legislative Branches that recognize the limitations placed upon them by the Bill of Rights, and a Judiciary that does not legislate from the Bench. WE demand fiscal responsibility and a Balanced Budget Amendment. WE demand a thorough revision of our Tax Laws and the dissolution of the IRS. WE demand Tort reform in which the loser pays. WE demand Term Limits. WE demand that Government gets its Hands out of our Pockets and its Regulations out of our Lives. WE demand our Liberty and our Freedom back. Thus might speak Mr. Thomas Jefferson.